Chris Colfer's life was getting very interesting recently, and what would meeting his new co-star Darren Criss do to his ever changing life? Originally for FF, now reposted by apparent demand. This is my slightly AU crisscolfer baby...some things are different but their chemistry is defintely there. Chris and Darren both went to East Clovis High, and eventually started dating. It was amazing until Darren dropped off the face of the planet after graduation, with not so much as a phone call. Years later, Darren is cast as Chris' on-screen love interest. 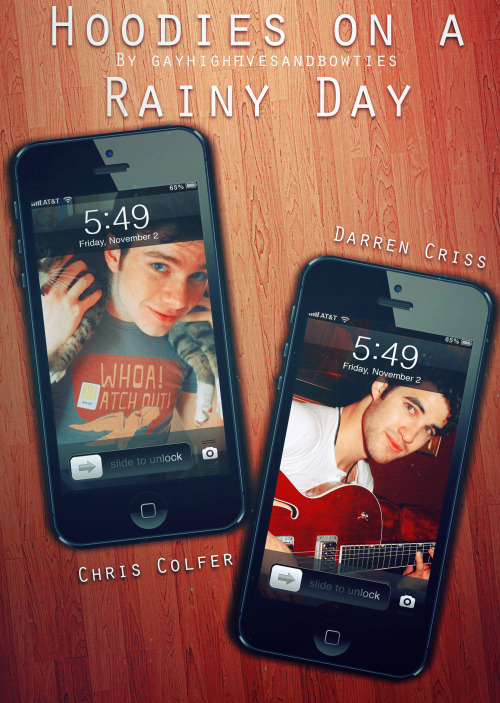 A CrissColfer Fic - Chris is in love with Darren, but Darren's straight and has a girlfriend. But what happens when Darren and his girlfriend split up, and then Darren has nowhere to live and ends up living in Chris' apartment? Eventual Criss Colfer. Darren needs to learn to move his hips for 'It's Not Unusual'. And there's really only one other person in the Glee cast that knows how to move their hips that well.. RPF. Darren and Chris met on the set of Glee. They had both seen a little of each others work but had never met in person before.